Rumors of the Emperor Napoleon's arrival were growing constantly. Everybody's attention was directed towards the great man and the political crisis which we hoped that he could settle favorably for Poland. The patriotism of the population showed itself in many ways in an effort to touch his heart. I was as much tormented as the others by this excitement and, in consequence, made a thoughtless decision. I went with one of my cousins to meet him on his way and to try to catch a glimpse of him. This imprudence changed my destiny. In simple costumes, my cousin and I climbed into a coach as the couriers announced that His Majesty was only one stage away from Blonie. I surrendered thoughtlessly to that enthusiasm, that rapturous excitement that was being felt by all. Every Polish citizen wanted to show their feelings to the man whom they already considered the Savior of our fatherland. The road was overcrowded with troops, luggage, couriers. Our carriage had a hard time maintaining its balance. In spite of this we urged the coachman to hurry. Questions never stopped. "Is the Emperor still far from here?" we kept on asking. When we arrived at Blonie, there were great crowds and relay horses were standing in restless readiness. This, of course, meant that Napoleon's arrival was imminent. But two women alone, with no man to protect them, were squeezed and shoved and almost stifled. In this desperate and dangerous condition, I feared I might miss the triumph which I valued so highly, and then we heard the noise of his carriage and the shouts of the people greeting him. When a moment of silence occurred, I cried out in distress to a French officer of high rank, before whom the crowd gave way, I raised my hands towards him and shouted in French in a beseeching voice, "Ah Monsieur, help me out of here and let me see him for just one moment." He saw me and smilingly grasped my hand and arm and, to my surprise, led me to the door of the Emperor's carriage. The Emperor had arranged himself near the window, and his gallant officer introduced us saying, "Look sire, this beautiful lady has faced the dangers of the crowd for you". Napoleon leaned forward and took off his hat and said something which, in my excitement, I could not understand. I gasped out, "Be welcome, a thousand times welcome to our land. Nothing we can do will ever convey with enough strength the admiration we feel for you nor the pleasure we feel seeing you on the land of our fathers. We have been waiting for you to save us." I was in a sort of trance, but my feelings exploded easily into words. How in the world I could have done this, shy as I was, I do not know. And where did I find the strength to speak my thoughts? I noticed that Napoleon was eyeing me carefully. He took a bouquet, which was in the carriage, and gave it to me saying: "Keep these beautiful flowers as a token of my good intentions. We shall meet again I hope, maybe in Warsaw, and I shall expect you to personally thank me." The important officer quickly returned to his seat next to the emperor and the carriage drove away rapidly, but the great man's hat kept on waving at me. I stood motionless, looking at the carriage until it disappeared in the distance, the bouquet grasped in my hand against my heart, my mind filled with a thousand new thoughts. I remember thinking, "Isn't this a dream ? Did I see and talk to the great Napoleon, the great Napoleon who gave me this souvenir, so flattering for my hopes,a token which was worth more to me than all riches in the world?" My companion had to nudge and push me to bring me back to reality. We left Blonie, returning home late in the evening. I went to bed emotionally exhausted but happy beyond belief. Warsaw was in a very excited mood. Nobody's heart could remain unmoved in the midst of such general enthusiasm. A spark of love, hope, and national honor, became a burning flame, engulfing the entire population, all classes and all ages united. Little children were jumping with joy, all patriots by birth... Oh how happy we were then. We thought that by Napoleon's mere presence, this man had liberated our fatherland forever and our hearts were beating with joy. I learned that the Emperor had dined with the count, who had invited as his guests the elite of the ladies of high rank. Wonderfully beautiful and witty, they graced the country by displaying their radiant charm. As for me, satisfied to have done my patriotic duty ahead of all of the others, and flattered to have occupied him for a moment, and to have received from him a precious promise and a token, I was modest enough to hide my triumph, enjoying it alone, and in silence. But my companion acted quite differently. She did not keep our secret. A few days later I had hardly arisen that morning when I received a message from one of our community's most important gentlemen asking at what time he could call, as he intended to pay me a visit. Greatly surprised with such an early request, I let him know I would receive him at noon. He appeared at the appointed moment and spoke in a most engaging and eager way. "Madame, I have come to ask why you did not avail yourself of the opportunity to accept the admiration of our august guest, as you are one of the most beautiful flowers of our land. I do not mention the pleasure that would be mine if I could have enjoyed seeing you at close distance. Our sole occupation should henceforth be to make pleasurable and enjoyable the stay of this great man, who holds all of our hopes in his hand. This is why I have come to beg you not to shy away but to accept an invitation to the ball I am giving at my home. I presume that you do not have to be introduced." He smiled and said, "We know everything, Madame." I was taken aback by his sly laughter, I blushed. I did not want to show that I understood what he had said. "Come, come, do not act humble any more. Do not hide your charm. Its secret has been betrayed, and I will tell you how I managed to know of your brilliant conquest. You must know that last Thursday night, he dined at the palace. The count had scattered around the table the most beautiful and clever ladies of our society. The great man was charming to all of them, but we noticed that his attention was more particularly directed towards the young princess. Delighted to have perceived what seemed a preference, we gave him the pleasure of seeing her at all future festivities that were given for him. But imagine how surprised I was when one of Napoleon's officers told me, "One has to admit that your ladies are remarkably superior in every way. When the Emperor returned from the reception the other night, he said to me, "Didn't you notice, Duroc, that the most beautiful flowers would have paled in comparison to this gathering of attractive ladies... but what happened to the young lady to whom I gave the bouquet at Blonie? He still regrets not to have found her." Countess Marie Walewska (née Laczinska) was born if 1786. At the age of 18, she married count Athenase Walewski, many years her senior, to whom she bore a son in 1805. During the French occupation of Poland, she met Napoleon and was encouraged by her patriotic friends to become his mistress, which she was at first reluctant to do. At last, however, hoping to influence the Emperor to deal justly with Poland, she agreed. Napoleon and the Countess fell in love, and she became his constant and loving companion. On the fourth of May, 1810, she bore him a son, Alexandre Walewski, whom he made a Count and eventually settled upon him a substantial estate, including ownership of a building at No. 48, rue de la Victoire, which provided an income for the mother. 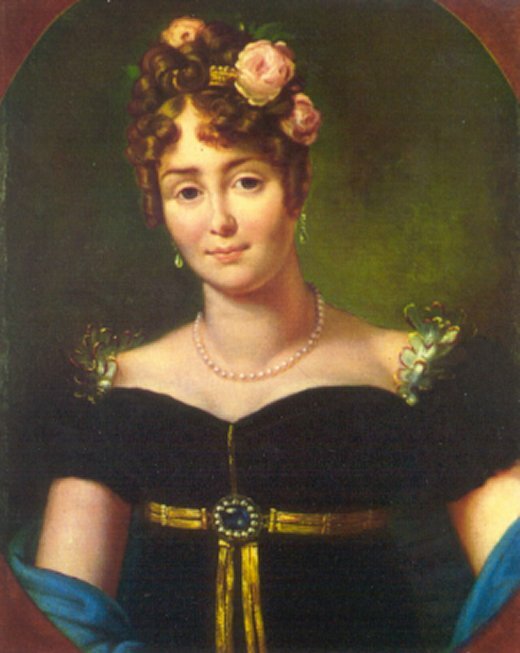 Marie Walewska remained faithful to Napoleon until his exile to St Helena. In September, 1816, she married his distant cousin, Count Philippe-Antoine D'Ornano. She died in childbirth in 1817, and her heart was placed in the d'Ornano crypt in Père Lachaise cemetery. Her body was returned to Poland. The son, Count Alexandre Walewski, was given a good education, having at the death of his mother become the ward of her brother, an officer in the French army. As time went by, he allied himself with the Orleanists, joined the Foreign Legion, and served with the military in North Africa, during which time he was awarded French citizenship. Returning to France, he became a friend and colleague of Adolph Thiers. He was appointed Minister to Copenhagen just prior to the coup d'état of Louis Napoleon. However, before he served in that capacity,the new government appointed Count Walewski Minister to London, where he accomplished the diplomatic understanding between the two governments which resulted in the visits of Louis Napoleon to England and Victoria's visit to France. While in England he married Catherine-Caroline Montague, whose father was the sixth Earl of Sandwich. She died in childbirth. During his diplomatic assignment as Ambassador to Italy, Count Walewski married an Italian, Marie-Anne de Ricci, who had family connections with Prince Poniatowski. Their son died without issue during World War I as a Lieutenant Colonel in the French army. Between these marriages, Count Walewski formed a long-lasting liaison with the great actress Rachel Felix. Their son was born at Marly-le-Roi in 1844 (d. 1898). The present distinguished Walewski posterity descends from this line. Count Walewski became very active in French politics during which period he was made Senator and upon the death of the duc de Morny, was named President of the Assembly. He was a member of the Academy of Beaux Arts. He died of a heart attack at Strasbourg in 1868.
of the Napoleonic Society of America.